John Deere D ouble Walled Chrome Exhaust Stack (with Bend) that fits Diesel Tractor models: 4320, 4430, 4440, 4450, 4455, 4520, 4555, 4620, 4630, 4640, 4650, 4755, 4840, 4850, 4955, 7020 -- ALL DIESEL ONLY. - 3 6 " Body, 2" Base -- 3 8 " Overall Length -- 3-15/16" Base I. - Db l Wall Lined -- 16 Gauge. Sale Depends on Stock at the Time. Only the 48 contiguous States in the U. 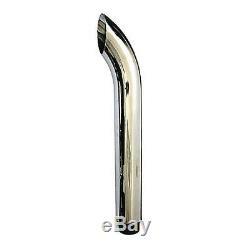 The item "New John Deere Chrome Exhaust Stack with Bend 4320 4430 4440 4450 4455 4520 4555 +" is in sale since Wednesday, March 20, 2013. This item is in the category "Business & Industrial\Heavy Equipment Parts & Accs\Antique & Vintage Equip Parts". The seller is "stevenslake" and is located in Williamston, Michigan. This item can be shipped worldwide.